Pumpkin, spice and everything nice. Place cookies in a food processor and pulse to form fine crumbs. Melt 1/4 cup butter in a medium saucepan. Add cookie crumbs and stir over medium heat for 5 minutes or until toasted. Remove from heat. For caramel, bring brown sugar and 1/4 cup water to a simmer. Cook for about 10 minutes or until color changes to dark amber. Do not stir, but watch closely. Stir in cranberry sauce and remaining butter. Return to simmer and continue stirring until well combined and thickened slightly, 3-4 minutes. Remove from heat and let cool to room temperature. While caramel is cooking, press enough warm cookie crumbs to cover the bottom of small serving glasses, see tip. Set aside. In a medium bowl, beat softened cream cheese and powdered sugar until light and fluffy. Add pumpkin and continue mixing to combine. Gently fold in 3/4 of the whipped topping. 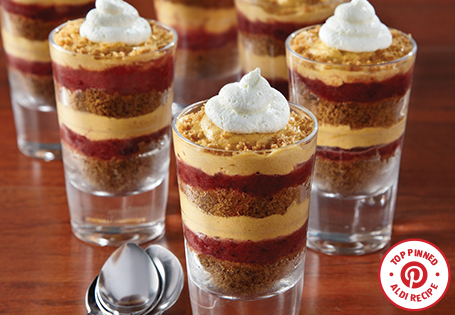 To complete assembly: top crumbs with cranberry caramel, pumpkin cream, followed by more cranberry caramel and crumbs. Repeat the layers 2 to 3 times depending on the size of the glass used. Top each parfait with a dollop of whipped topping. Serve immediately or refrigerate up to 8 hours.